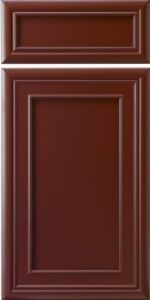 One of Conestoga’s (CWS) oldest mitered designs, the CRP-10946 was made popular by Quakermaid Cabinets when they were one of the preeminent names in high-end cabinetry. While NOT AVAILABLE FOR INSET CABINETS, this timeless design is now offered in full five-piece MDF construction, with mitered joints and called the CRP-10946 (MDF). If you opted a painted finish for this timeless classic, then select the CRP-10946 (MDF).